Here are some examples of famous firsts that curious kids will find in The Scholastic Book of Firsts by James Buckley Jr.
—American Steve Fossett took 16 days to float around the globe in 2002. —“A Trip to the Moon” came out in 1902! —Harry Potter and the Goblet of Fire made the top spot on The New York Times’ Best-Seller List in 2003. —Keds went on sale in 1917. —Kids in 1829 first enjoyed this snack, named for its inventor, Sylvester Graham. —The first fossils of the fierce Tyrannosaurus rex dinosaur were found in 1902. —Ming Kipa was only 15 when he made it to the top in 2003. —Fred Thayer invented this face-saving device in 1878. 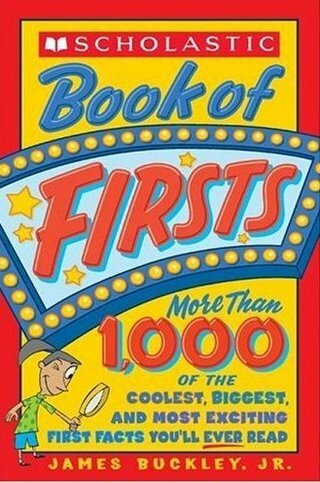 There are thousands more fun first facts in The Scholastic Book of Firsts!